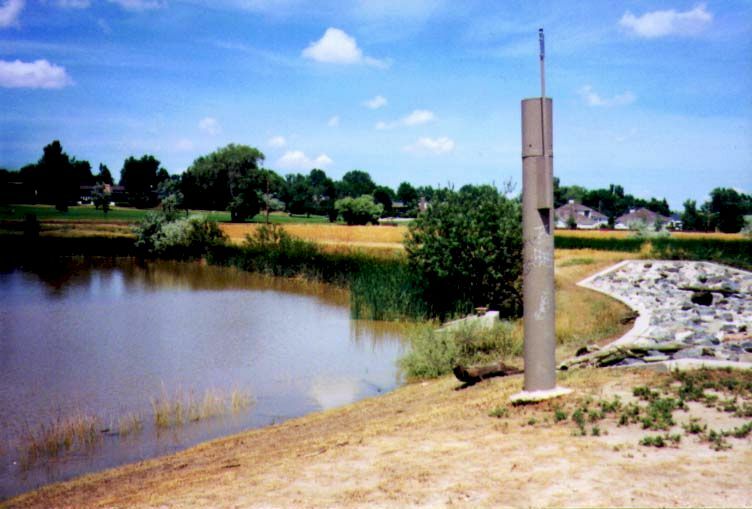 In 1988, the District and the City of Broomfield completed $370,000 in flood control improvements along Basin 3207 Drainageway (also known as Nissen Reservoir Channel) between E. 10th Ave. and Ash St. in Broomfield. 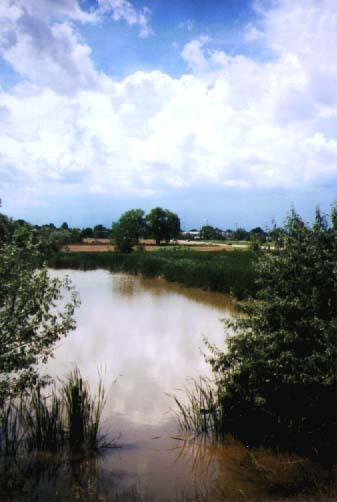 This project involved the construction of two detention facilities (Ponds 6 and 7), which effectively reduced the 100-year discharge downstream by more than half (from 1090 to 480 cfs). 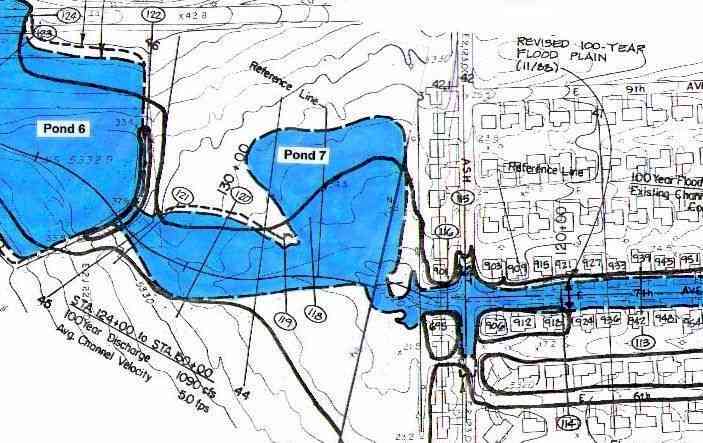 This peak flow reduction resulted in a regulatory floodplain confined to the street and front yards along E. 7th Ave as shown in the figure, thus removing more than 60 residential properties from the 100-year floodplain. At Pond 6 the July 25 storm produced 2.76" of rain and resulted in a peak stage of 38.6 feet, equaling the 100-year design flood according to the consulting engineers' design report prepared by Sellards & Grigg, Inc. The data plot shows the stage hydrograph and 30-minute rainfall amounts between 7/25 noon and 7/26 midnight. A resident at the intersection of E. 7th Ave. and Birch St. measured 3.45" of rain. The storm hit the Basin 3207 area shortly after 5 p.m. with the first inch of rain falling within the first 20 minutes, causing major street flooding. 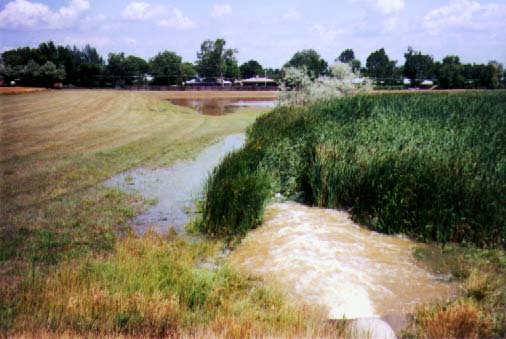 Runoff quickly filled both detention ponds to capacity. The Pond 6 peak occurred at 6:54 p.m. cresting at a depth of 19" over the spillway and releasing 470 cfs. Measurements at Pond 6 were made by an automated gauge that was installed as part of the flood control improvements (see photo). Prior to the July 25 storm, the largest recorded event occurred on May 17, 1995, with the water surface reaching a maximum stage of 35.7 feet. It is suspected that this stage may have been exceeded on July 19, 1997, but no data was available for this event thanks to the work of vandals on the preceding day. The Basin 3207/Pond 6 gaging station is one of 143 ALERT stations operated by the District. 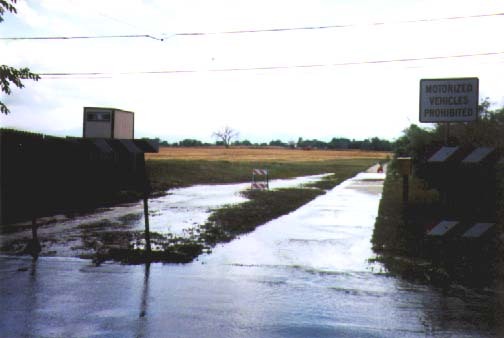 July 25, 1998 high water debris line at 918 E. 7th Ave.
During and following the July 25 storm, local officials received reports concerning flood problems at a number of locations throughout the City, but the actually damages were relatively low considering the magnitude of the event. Five homes in the 900 block of Birch St. and three in the Eagle Trace Subdivision had water backup in their basements from sanitary sewers. The City later determined that this problem was caused by some unsealed manholes and property owners were compensated for their losses. No sewer backups were reported along E. 7th Ave. At least one resident along E. 7th Ave. did report two-inch deep water in her basement, presumably from seepage or poor site drainage. She also said that her property had been flooded five times in the past 26 years and this was the first high water since the flood control improvements were completed. The National Weather Service and Henz Meteorological Services (private forecast/notification service used by District) had the storm potential pegged early in the day. HMS first notified the District of the developing weather situation at 9:52 a.m., concerned about the potential for storms capable of producing rainfalls of 4.25"/hour and 3"/30-minutes. All District local governments were notified of this threat by 11:20 a.m. The NWS issued a special weather statement at 11:40 stating that "torrential rainfall rates are again possible." This public statement also indicated that 3 to 4"/hour rains were possible and that the NWS would likely issue a flash flood watch later in the afternoon. The watch was issued at approximately 4 p.m. and HMS updated local governments on the situation. The weather forecasting and coordination efforts that occurred on July 25 between HMS and NWS are indicative of the partnership that has evolved over the years. 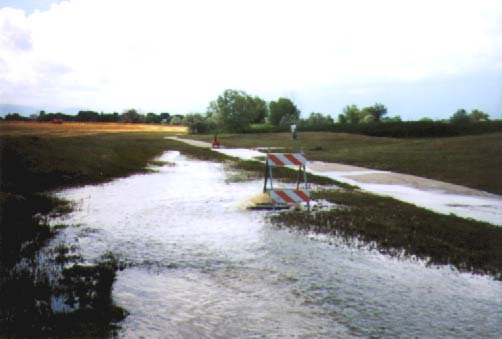 The District's Flash Flood Prediction Program (F2P2) just completed its 20th year of service. Other parts of the Denver metropolitan area were impacted much worse than Broomfield on July 25. 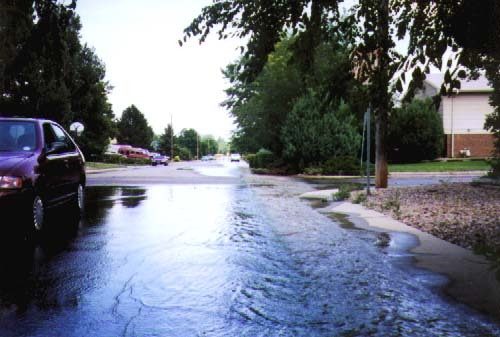 Consequently, the flooding in Broomfield went relatively unnoticed by the news media. In Denver, an unofficial rainfall report of 5.6" in the vicinity of Federal Blvd. 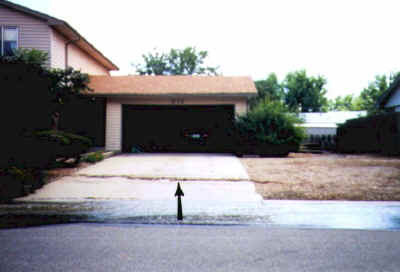 and Evans Ave. drew the attention of the media where street and basement flooding was occurring throughout much of southeast Denver and Englewood. Runoff filled the Logan Street underpass of I-25 to a depth of 15 feet. 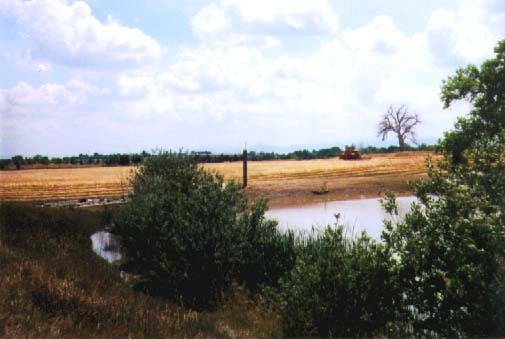 The South Platte River at Denver experienced its highest peak (13,800 cfs) since the flood of 1973. The ALERT system measured rainfall amounts exceeding one inch in less than one hour at 22 locations. The storm that hit Denver occurred about one hour after the Broomfield storm, while the earliest reports of heavy rainfall were from the foothills of Boulder County shortly after 4:30 p.m. 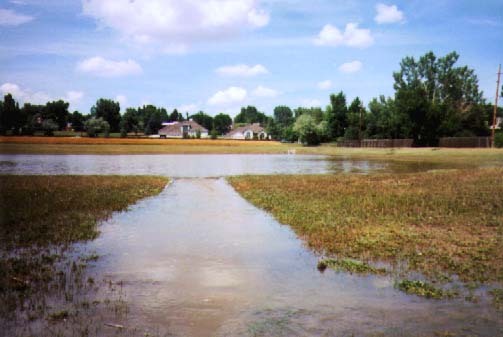 In summary, July 25, 1998, was a very wet day for the District and a very successful day for flood control in Broomfield. Congratulations to all the agencies, businesses and individuals who contributed to make July 25 a non-newsworthy event for Broomfield. An article elsewhere in this Flood Hazard News contains information about other significant 1998 flood events. 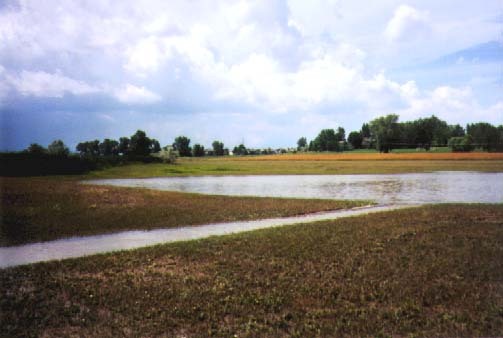 Flood documentation is a routine function of the District's Floodplain Management Program. More detailed information may be obtained by contacting the District. Looking west from E. 7th Ave. and Ash St. Looking east at E. 7th Ave. Looking west from E. 7th Ave.
All photos in this gallery were taken on Sunday, July 26, 1998, between 1:00 and 2:00 PM.